It’s raining birthdays at the Kapoor household. Recently Karisma Kapoor’s elder daughter Samaira’s 13th birthday was celebrated. Karisma along with her ex husband Sanjay Kapur threw a lavish party to celebrate her entry into the teens, making it look like one sweetest surprise ever. Little did we know Karisma’s younger son Kiaan’s birthday too falls a day after Samaira’s birthday(March 11). Yes! 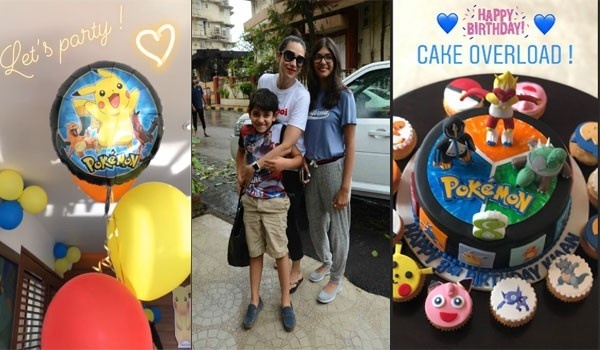 The young champ turned 8 on Monday and the loving mommy ensured to make it all the more special by gift him his favourite Pokemon themed birthday bash. Karisma’s Insta story is our album for the day. She’s even posted Kiaan’s pic on her page with a caption saying, “#happybirthday#myjaan#reachforthestars#mama’sjaan #pokemongo”, proving how much she adores her son. We are sure Kiaan must have been the happiest to see all the surprises coming his way. That way, Karisma is one hands-on mother who prioritizes her kids over anything else. In fact, the reason why they don’t make frequent public appearances is also because Karisma wants them to have a normal childhood and not one that’s controlled by the paparazzi as she had once mentioned, “I try to shield my children as far as possible from public glare. I want them to have a normal childhood, like we had. We went to school by the school bus, had school food… There was no special treatment given to us.